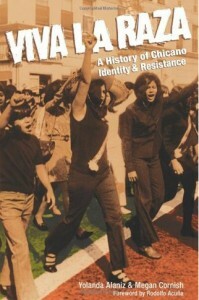 A riveting account of the struggle for Chicana/o liberation. Describes monumental battles in U.S. agriculture, mines and factories, and analyzes the vibrant movimiento of the 1960s and ’70s. The authors dissect the origins of racial and national oppression and focus unique attention on the role of women and the emergence of Latina/o lesbians and gays. Alaniz, Yolanda, Megan Cornish. Viva La Raza: A History of Chicano Identity and Resistance. Red Letter Press, 2008.